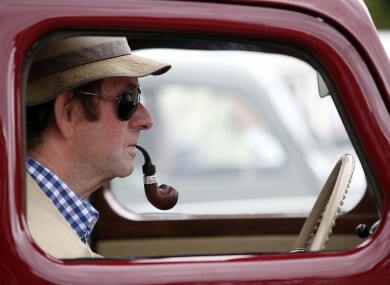 A vintage car enthusiast gets into the spirit at the 34th Irish Veteran & Vintage Car Club Powerscourt Picnic today. Libya’s rebel fighters have gained control of some neighbourhoods in Tripoli – and, claiming victory is imminent, have pledged to “strangle Gaddafi’s troops tonight”. The latest reports suggest that troops arriving from the west of the city met with little resistance as they moved into the city, though fighting remains intense elsewhere. Syrian president Bashar al-Assad has made a rare appearance on national TV, defending his military’s use of force to quell protests again him and unexpectedly announcing a general election for six months’ time. Norway has today paid tribute to the 77 people who died at the hands of Anders Behring Breivik on July 22, with a national memorial ceremony in Oslo bringing an end to a month of national mourning. The gender pay gap actually grew during the economic downturn, according to statistics from the CSO. The National Employment Survey found that as of October 2009, men earned 12.8 per cent more, per hour, than women did – up from 10.7 per cent two years earlier. The families of the two Co Down women murdered in Turkey on Thursday have arrived in the country and are making arrangements to bring the bodies of the two women home. Today it was reported that the ex-husband of one of the murdered women, Kathy Dinsmore, lost his current wife on Thursday too. The World Youth Day festival has ended in Madrid, with the Pope urging its 1.5 million attendees to “become missionaries for the faith”. He also announced that the 2013 edition of the festival will be held in Rio de Janeiro. The Pope had earlier been forced to curtail his remarks during a prayer vigil as a result of fierce storms. Sexual assault charges against former IMF managing director Dominique Strauss-Kahn could be dropped on Tuesday, according to US reports, because Manhattan prosecutors now feel they cannot bring a case against him given question marks over the reliability of his alleged victim. Michael Noonan is reportedly set to announce his three-year plan for budget cuts in October – and today was given food for thought by Michael O’Leary. The Ryanair chief says he’ll leave Ireland if income tax is raised too high – but is willing to pay a 50 per cent rate, and has outlined his own proposals for income tax reform. The Rose of Tralee festival is kicking off in Tralee this week, so ahead of the main contest tomorrow and Tuesday, last year’s winner Clare Kambanettu has been telling us about what it’s like putting up with constant Lovely Girls jokes and whether there’s life after a year as the Rose. Independent TD Maureen O’Sullivan has given her formal backing to Michael D Higgins’ election campaign – but says she’d still consider offering her support to nominate an independent candidate if one still wanted to run. Tyrone 16-year-old Janet Devlin has been installed as the early bookmakers’ favourite to win this year’s X Factor – despite her performance being broadcast on only the first audition show of the year. Mark Zuckerberg (probably) does not Like this: data protection officials in Germany have declared Facebook’s ‘Like’ button illegal, and have ordered all entities in one province to remove the feature from their websites. Not only that, but they claim that it’s illegal under EU law – raising the prospect of the button being banned across the continent. “Irish eyes are smiling! Robbie Keane, welcome to Hollywood.” The soon-to-be-either-immortal-or-forgotten words of the Prime Ticket commentator who narrated over Keano’s opening goal for the LA Galaxy last night. Among other sporting eyes that are smiling today: the Kerry footballers, who booked their place in yet another All-Ireland decider with a 1-20 to 1-11 win over a dogged Mayo, and the Tipperary minor footballers who overcame a late Roscommon comeback to make it to their own All-Ireland decider. Looking for something to read? Look no further than our Sitdown Sunday collection: including features on the people auto-tuning the world, the fishermen who ruined Iceland’s economy, and the rise and rise of Michele Bachmann. Ever listened to BBC Radio 4′s nightly shipping forecast? If so, you’ll know that it’s famous for its strange soothing properties. Now we have a reason to explain its strange soothing quality: its reader dons a leopard-skin slanket every night before it’s read. Finally this evening: have you ever wanted to send your least-favourite TV personality into space? Well, if you happen not to like Stephen Colbert, consider it done… ish.